#RoadsFromRome Day 12 - The Final Push. The Longest Mile. I stirred from a deep sleep at 04:30 this morning, and headed to the Stena Lines ferry breakfast buffet for one last fuel-up. The final day of this trans-European tour was always going to be a big one. Rolling back onto terra firma at 06:30, I headed out of Harwich ferry port and onto the quiet and deserted lanes of Essex. As with all my route planning for this trip, it wasn't about taking the most direct route to get to Portsmouth, but rather the most interesting and enjoyable. 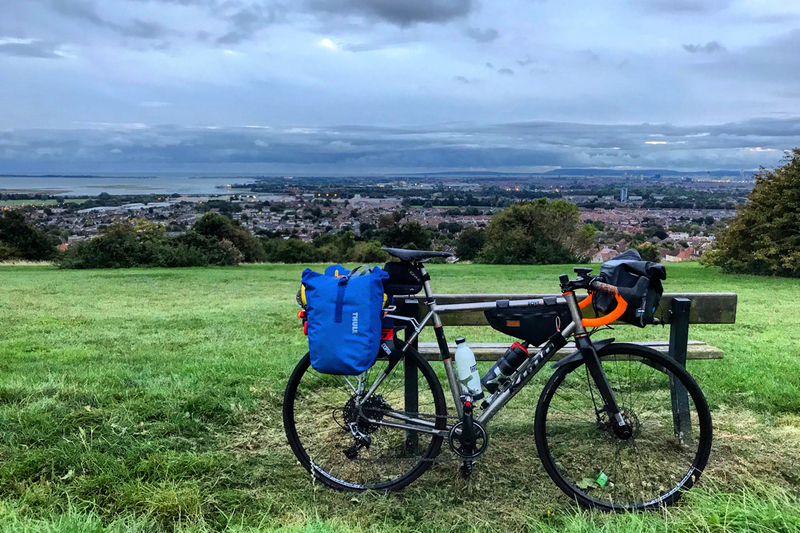 The result was that I was taken through sleepy villages, open farmland, and past beautiful estuaries as I rode south and west towards London. The route was beautiful, but it seemed slow. I knew I had over 270 kilometres to cover today, and that seemed like a hell of a distance on a bike weighing 26 kilograms fully loaded, and with legs that felt like dead weights. At noon I hit London on peak lunch-hour rush. Riding in through Brentwood and Rochester, I was soon into The City, and then onto the South Bank. Stop. Start. Stop. Start. Look out for that bus. Look out for that mobile phone zombie businessman crossing the street. Look out for that HGV driving down the cycle path. I was reminded quite how little I miss my time riding bikes in London traffic. By 13:00 I was through the mayhem, and grabbed a quick coffee and sandwich in Richmond Park. The over-indulgent breakfast (I had some looks from a few people on the ferry) had finally worn off, and I needed some fuel before the Surrey Hills. I used to call the Surrey Hills the 'Surrey Molehills', but today they felt like proper hills. My route took me over some of well known single track climbs of Chalk Lane, Clammer Hill and Prestwick Hill. I felt every one of those. By 17:00 I was empty – a shell. The skies had darkened and I had pulled on a waterproof. The final 60 kilometres felt like they would be the longest of the entire trip. Yet, after a few stroop wafels, Dutch cinnamon sweets, and some stern talking to myself, I managed to muscle up the strength for the final few climbs. Harting Hill was a killer, but then it was only Portsdown Hill to go. At the summit of this final climb I lent the bike against a bench and took the above photo in the fading light. A descent to the finish, the ferry, and the final few yards home. Boarding the ferry was a surreal moment. Just 15 days before I had been struggling off it; bike in a cardboard box, headed for Rome. Here I was now stumbling back onto it; wheeling the bike fully-laden up the gang plank, and parking it up as I had done for years on my daily commute. Something so ordinary to me, yet so completely different this time. What a journey this has been. There have been highs and lows a plenty. There have been moments of laughter, love, and huge broad smiles. There have been moments when I have honestly felt like throwing the bike on the ground, and curling up in the hedge at the side of the road. It seems like a year ago that I left, and yet only two weeks has passed. Thousands of kilometres. Thousands of memories.